this is not about these men. not directly, anyway. i know very little about them – indeed, i can only identify two of them with any degree of certainty. no, this is about how i got this picture – the web of their descendants and relations that led to this picture being on my hard drive. it is about the choice to be related to someone, the chance to reconstruct family ties that are so old and broken that they might as well be invisible – and are, for all intents and purposes, except to me and the cousins who try to unearth them. 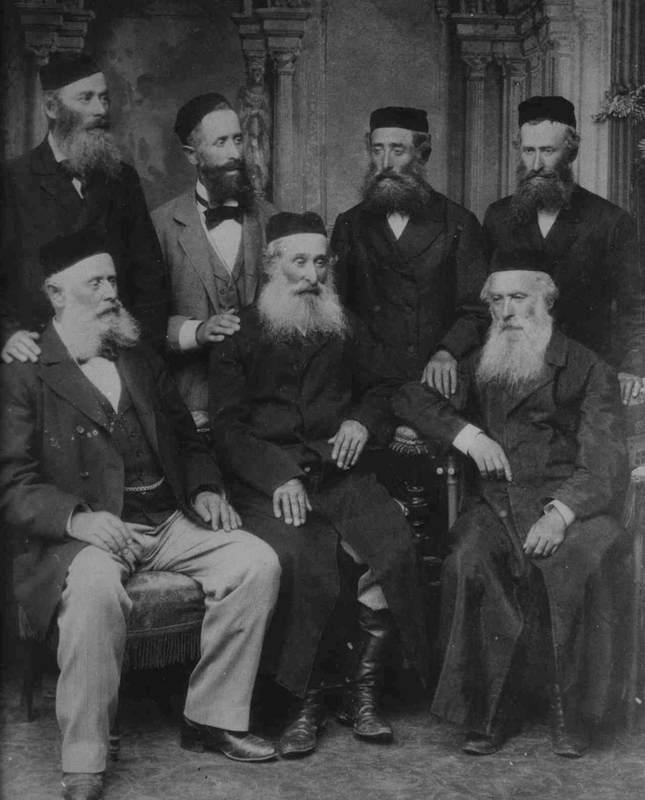 these seven men are the brothers of my great-great grandmother ettl leya acht, therefore my great-great-great uncles. an inscription says it was taken in 1891 – or maybe 1894 – and i suspect it was taken in what is now l’viv, ukraine, where they were born. at this point in time, they did not all live in l’viv – one brother lived in timisoara, romania, another lived in budapest – but it would seem rational to assume they all gathered in l’viv for some reason. what that reason is, i don’t know. just like i don’t know much else to tell you about these men, besides the dry information of their dates and the names of their wives and their children. instead, i will tell you about my miraculous circle of cousins, the way the common genes and (apparently) values these brothers (and sister!) passed down to us show themselves even now, and about the wonder of recreating a family that you thought was lost – or perhaps never existed at all. three and a half years ago, i did not know that these men ever lived. indeed, i tacitly assumed that any family that might have lived in their place were exterminated, that the line ended in dust. i was wrong, because three and a half years ago, i received an email from a man in israel. he had decided to see if he could verify a familial oral history and in the course of his research, found me – or rather, something i had written on the internet. his email, which i received during a very rough time in my personal life, was like a revelation of sorts, a little ray of light, and a complete surprise. where i thought there was only dust, there were hundreds and hundreds of cousins including this emailer, my fifth cousin shuki, the first distant cousin i’d ever met who wasn’t at least a generation older than me and was more importantly a collaborator, someone who cared about these things as much as i did and possessed research skills that still make me sigh a little bit in awe. other cousins followed, populating a tree i thought was mostly dead: francesco, who too emailed me out of the blue, called me on the phone and took me out for breakfast in san francisco one morning; richard, who sent a relative a letter that circled into shuki’s lap when he found the same lady himself, who tracks down the email addresses of our living relatives, invites them to lunch, and sends me email updates that illuminate little corners of people’s memories; steve, who submitted pages of testimony to yad vashem in 1978 that we found in 2005, who collected and circulated this picture and others to cousins all over the world, and gave me car shopping tips over brunch just a few months ago. these cousins of mine are not close relatives – third and fourth cousins, all – but they are the family i choose. what binds us is not the close blood ties and complex emotions we may share with our siblings, first cousins, aunts or uncles – but i like to think that the commonality of our interests and passions is the manifestation of a gene passed down to us by the ancestors of these acht brothers (one, which, by the way, also manifests itself in a statistically improbable number of professionals, academics and smarty-pantses amongst acht descendants) and in that way, bridges the gaps that divide us. we are cousins because we choose to be – it would be just as easy to decide not to acknowledge our shared origins, being so loosely related to one another. but instead, we cherish these bonds we have unearthed from forgetfulness, creating a little community that i am incalculably glad to be a part of. we may not talk very often, know the intimate details of each others’ lives or even have met in person, but there is something to be said for simply knowing a connection exists, for knowing that there are these small things we share in common. i know that my life is made richer because of these connections – and in this i speak not just of these cousins, but the others i have found in different places, who share different chromosomes. somehow in meeting people, in talking to them, i feel as though i gather up pieces of myself that i didn’t know were there, in some measure unraveling essential truths about who i am and where i am from. once when i was talking about becoming an archivist, francesco said something about how people like me are needed in a world where history is cheap. i like knowing that i am related to other people like me, who think that history is in fact immeasurably precious, that memory and its relation to us is something worth the time it takes to think about it. like it or not, men like these acht brothers are a part of us whether we know it or not, and i am glad that i know it. this just made me cry. the world does need more people like you. thank you.people like you, too. This is amazing! “in a world where history is cheap…” that is incredible. This made me cry too.